We love pan-cooked chicken. Our Savory Chicken Breasts are a good example. Easy to make, our Sweet Tweetee Seasoning gives a savory flavor with a bit of sweetness, giving you a dish which can pair up with just about any side dishes you would like. Wild Rice, Rice Pilaf, Pan-Roasted New Potatoes, and just about any vegetable. We like to serve roasted Brussels Sprouts or Steamed Broccoli. A simple side salad works well too. That’s why we love this dish, since it goes so well with many side options. We will also change up our seasoning but keep the same recipe. 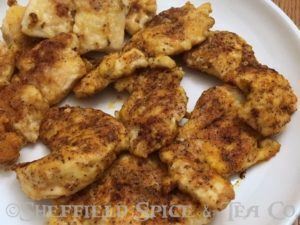 Cut chicken breasts into 6 pieces each. Pound flat, to no more than a ½ inch thick. Pour flour onto a plate. Add one tablespoon of the seasoning to the flour. Coat both sides of chicken in the flour. Heat a large non-stick skillet over medium heat. Add the butter or oil to the pan. When the butter has melted or the oil starts to shimmer, add the chicken to the pan. Sprinkle more of the remaining seasoning on the chicken. Let cook for a minute. Flip the chicken pieces, and sprinkle on the rest of the seasoning. Cover with a lid, turn down the heat to low and cook for about 10 minutes. Flip over and cook for about another 10 minutes, or until the chicken of thoroughly cooked. Watch to make sure it doesn’t burn. Remove from heat and keep warm until you serve them.